Salome, for those of you new to the story, is the Strauss opera based on Oscar Wilde‘s play by the same title, a somewhat scandalous imagining of the fate of John the Baptist in the dungeons of King Herod. Because British law at the time forbade the representation of Biblical characters onstage, he wrote the play in French and then “translated” it into English – Strauss then adapted it again into German. 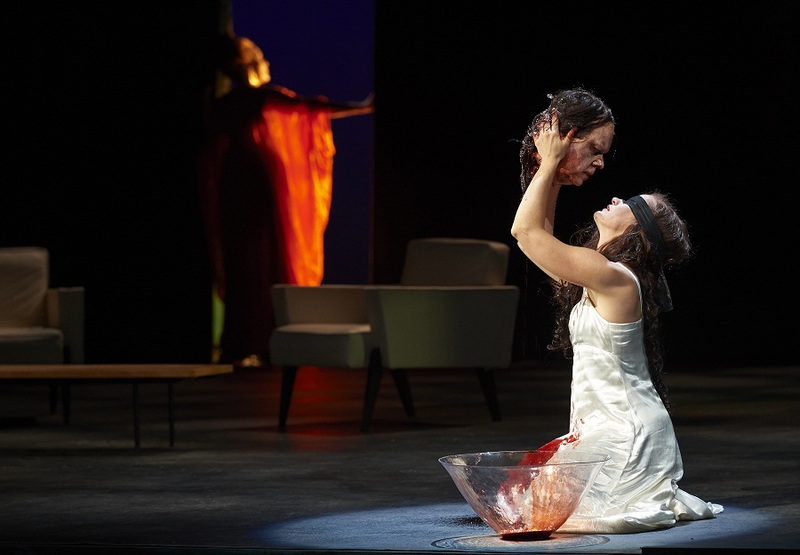 This is the third iteration of filmmaker Atom Egoyan‘s staging of Salome at COC, and I have to admit that I’m confounded as to why. Three stagings (1996, 2002 and now again in 2013) suggest to me that there are a critical mass of people who love this staging and clamour for it to return. To be perfectly frank, after all the rank anti-Semitism, the distressingly creepy childhood-and-sexuality themes, and the video images of women who seemed to be dead and rotting away until they were eventually revealed to be coated in mud – I would have paid money to be allowed to leave. The degree to which I did not like this piece was significant. It may be that it was a bad match for me as a reviewer. I am not always the biggest fan of the brutal, dark, and damaged, even if the visuals are interesting. These were, with a significantly tilted stage pointing out the off-kilter reality of the world into which we were seeing; the heavily medical and military costumes similar to the wardrobe for COC’s production of Margaret Atwood’s The Handmaid’s Tale. Dystopian signifiers abounded. But Egoyan, famous for his treatments of the erotically creepy, ultimately made a lot of choices that pushed this production of Salome – an already skin-crawling tale – past the watchability point for me. Erika Sunnegårdh, singing the role of Salome, surprised me – hers is a big and bright voice, especially at the top, and with her significant acting talent Salome is a capital role for her. In the moments that I closed my eyes against the visuals of this productions and just let the silk of her voice wash over me, free of the supertitles and gloom and difficult tableaux I was delighted by it. I regretted that Martin Gantner sang the role of Jochanaan (John The Baptist) for the performance I saw; Alan Held is clearly the superior baritone and I wished for the signature warmth of his voice and great expressions. I wonder whether I might have enjoyed the whole opera better with Held than Gantner – the duet between Salome and Jochanaan I saw seemed disconnected and rote, Gantner quite good in his movements but shrug-worthy of voice. Oh, well. At the end of the day, this was difficult for me to like. If you’re more inclined toward the films of Atom Egoyan, or if you adore German opera unreservedly, you might enjoy it more – but still, I think, it may be worth the extra week’s wait for the Held and the May performances. Thank you for this review. It is consoling to know that I am not the only one who found the staging of Salome at the COC quit vulgar. I agree with all points in the review and frankly wish I read it before going to watch the show (unfortunately I came very unprepared with a naive expectation to see a biblical scene, a seductive and mysterious Salome dancing the so popular seven veils dance). On thing is true, that if one closed their eyes, the experience could be salvaged by focusing on the music.